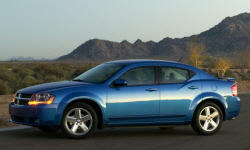 Dodge Avenger Pros and Cons | Page 1 of 1 | Why Not This Car? What drives people to buy (or not buy) a certain car? TrueDelta's members share Dodge Avenger pros and cons based on their real-world driving experiences. No reason not to buy this car. Unless you like wasting money on what the experts claim is better than this I tested overa dozen cars that Motor Trend always picks over Dodge cars. I'm very glad that I waited on this one. I picked this car over the Hyundai Elantra (1.8l) due to it having the trunk space and shape that I needed, over the Toyota Tacoma (2.7l) for fuel economy and speed, and over the Dodge Nitro (3.7l) because it was slow and had bad mpg. I wanted to buy a truly American made car.I have always purchased American Made cars and since I have had good luck with Dodge in the past, I purchased this one. Rear Visibility is hindered by the rear door styling, they created two MASSIVE Blind Spots in the spot where you would normally turn your head to look back. .The highway gas mileage-33-35 mpg w/4/cylinder engine at 65 mph. City driving gets about 21-23 mpg. Different from any other mid size car. I like the slab look over round look of most cars today. Looks like a smaller version of the Dodge Charger.My wife liked the Charger, but thought it was too big. Plenty of interior space, seats are pretty comfortable. I like the old school look of the rear quarter panels.A person can drive a four door and it still looks sporty.